← Will The Rightline Gear SUV Tent Work On A Ford Transit Connect? It is my goal to leave the factory soft top off of the Jeep Wrangler for the entire summer. After all, we live in the moderate mountain climate of Asheville, North Carolina. I will have a bikini top as a back-up to protect driver and passengers on the occasional rainy day. 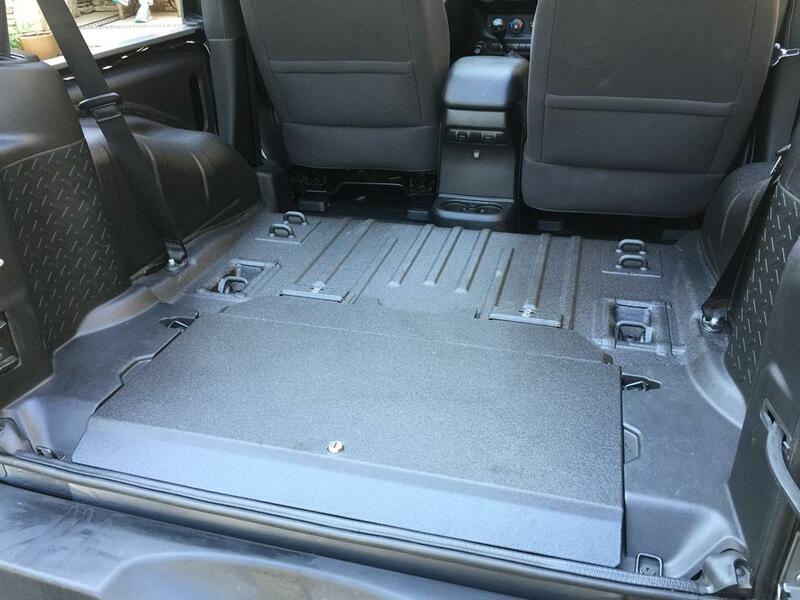 The bikini top will protect the front seat area and most of the rear seat area, but what happens when it rains on the tailgate area and in through the open sides of the Jeep? It sounded like I would be looking at some soaking wet carpet much of the time. Enter the idea to remove the carpet and have Rhino Linings sprayed on the interior of the Jeep. It sounded like a great thought, however, I had never seen it done before. 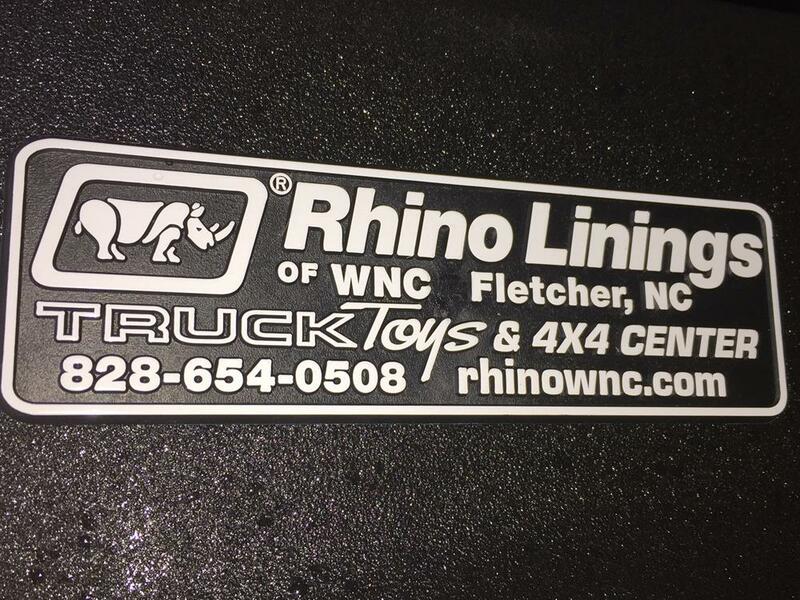 I went to discuss the process with Robert Demetris of Rhino Linings of Western North Carolina (Truck Toys and 4×4 Center), located in Fletcher, NC. 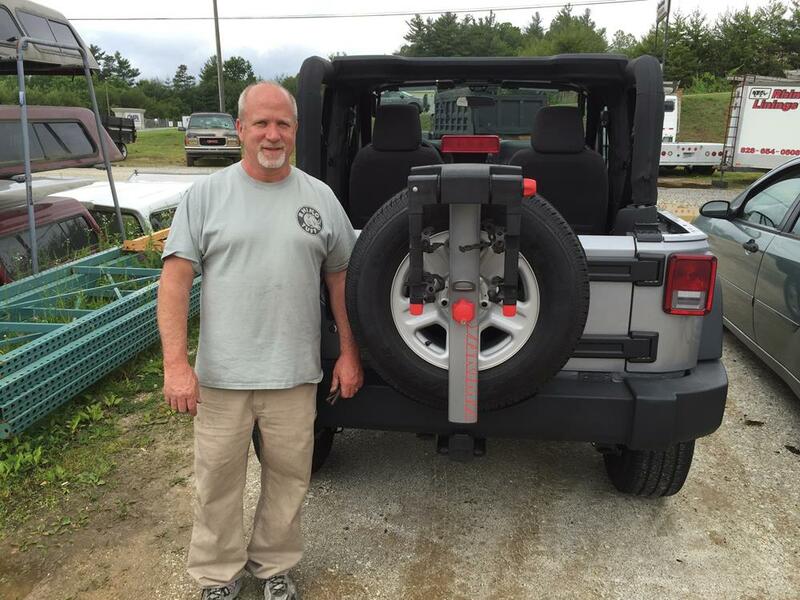 Robert shared his past experience working with Jeep Wranglers and graciously offered to sponsor our build. He recommended Rhino Lining’s Extreme Coating. 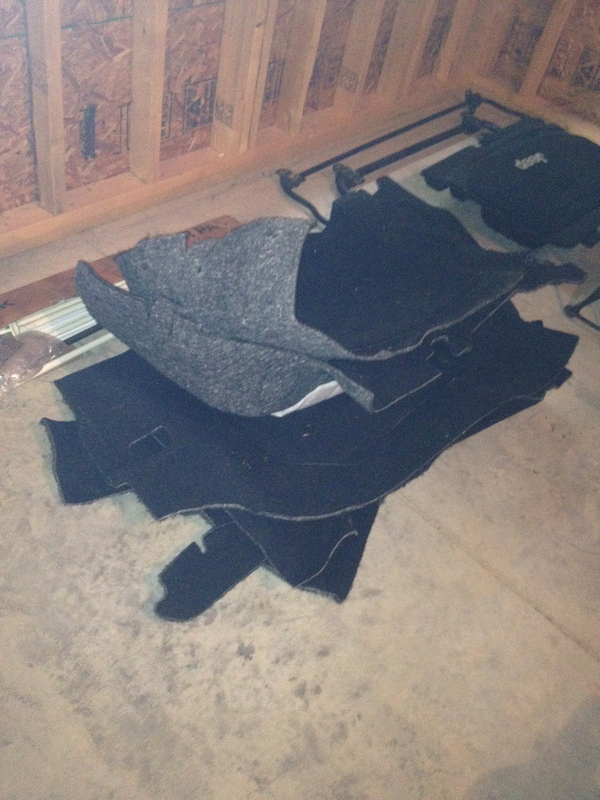 My first step was to remove the carpet from the interior of the Jeep. 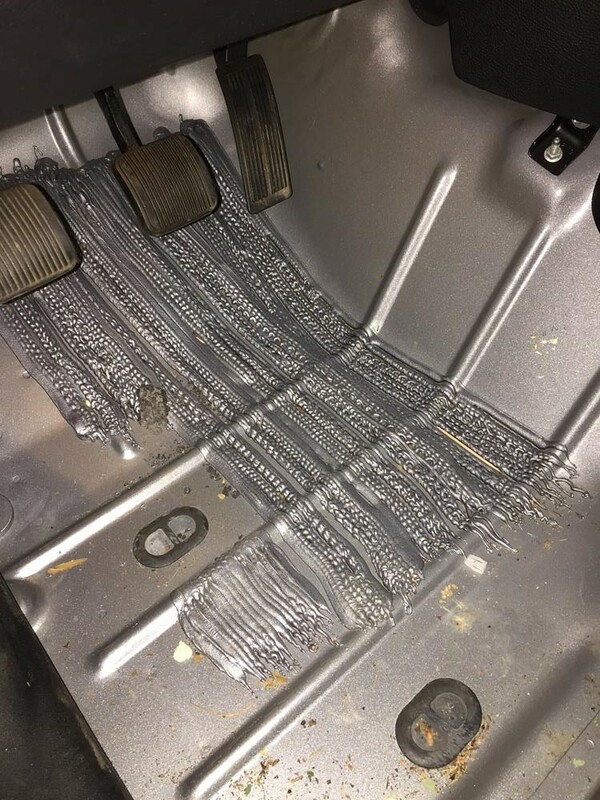 Under the carpet, I found a whole bunch of sound proofing ‘goop’ adhered to the driver side floor board, the passenger side floor board, and under the rear seat. The ‘goop’ was the same color as the Jeep but the floor board seemed to be painted before it was applied. 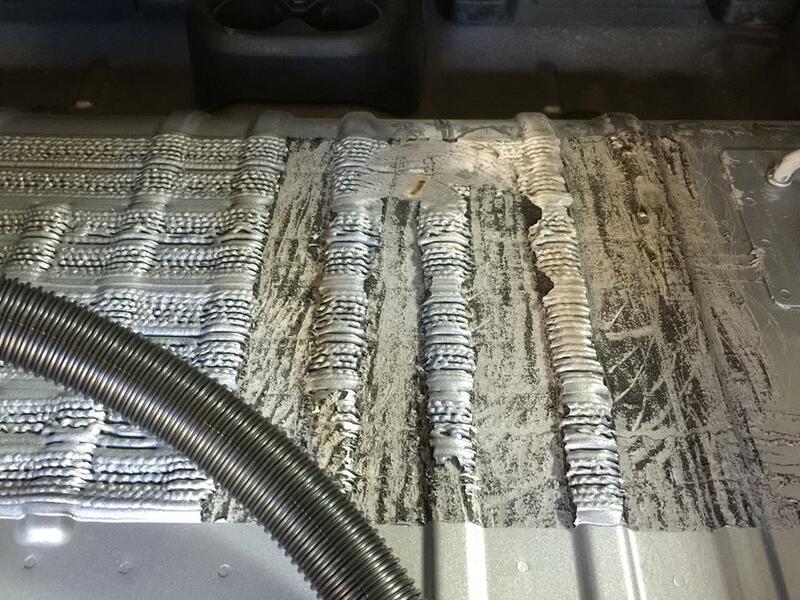 Until you start to chisel this stuff out a bit, it is hard to tell what it is made from. Actually, I am still not sure – some type of rock hard foam-like substance. The obvious questions to ask one’s self at this point were: “Why does the Jeep need this much ‘goop’ and why was there white padding under the carpeting in these same areas? If I scrape the goop out and remove the carpet, is there going to be an extremely loud noise coming through the floorboards?” I, never-the-less, decided to proceed forward, using a heat gun to try to soften the ‘goop’ and scrape it out. That plan didn’t work. Next, I tried to use a hand held grinder. That plan didn’t work either, but it succeeded in putting a fine coating of ‘dusty goop’ all over the interior of the Jeep. My best results were achieved when chiseling the ‘goop’ with a large flat head screwdriver, but I wouldn’t wish this job on my worst enemy. Eventually, I punted and humbly drove the Jeep to Robert’s shop. Robert’s crew used a heat gun (evidently much more powerful than the one I had) and a 5 in 1 tool to remove the remainder of the ‘goop’. I showed back up a few days later to a fantastic result. As you can see, the Rhino Lining was sprayed over the Tuffy Locking Cubby Cover so that the cover appears as part of the floor. 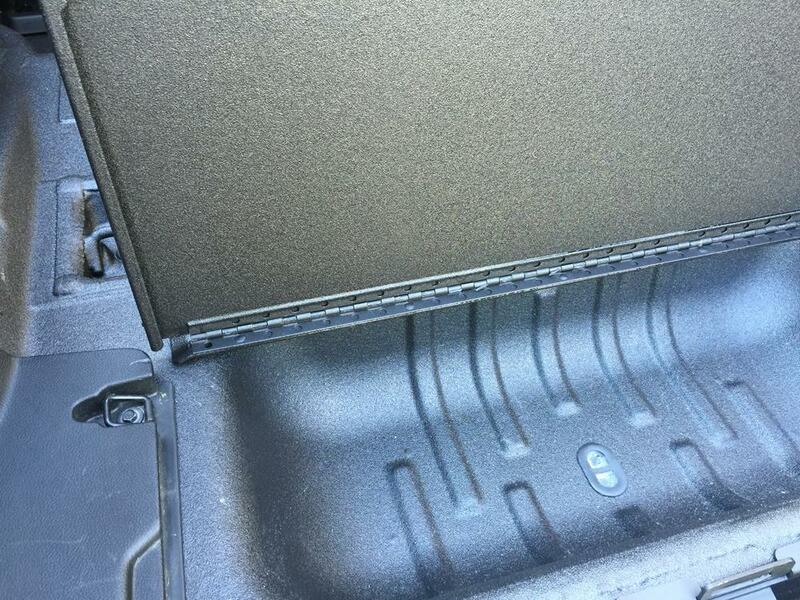 The Rhino Lining was sprayed on the inside of the cover and into the storage compartment as well. We kept the plastic trim on both sides of the cover to keep a finished look. Robert’s crew even sprayed the door sill on driver side and passenger side to prevent the scuffing that always takes place in these areas. Now that’s the way to get an entry guard! You can see all of the plugs that can be removed from the floor board to let water from rain or cleaning drain right out. As an added bonus, no floor mats are needed! 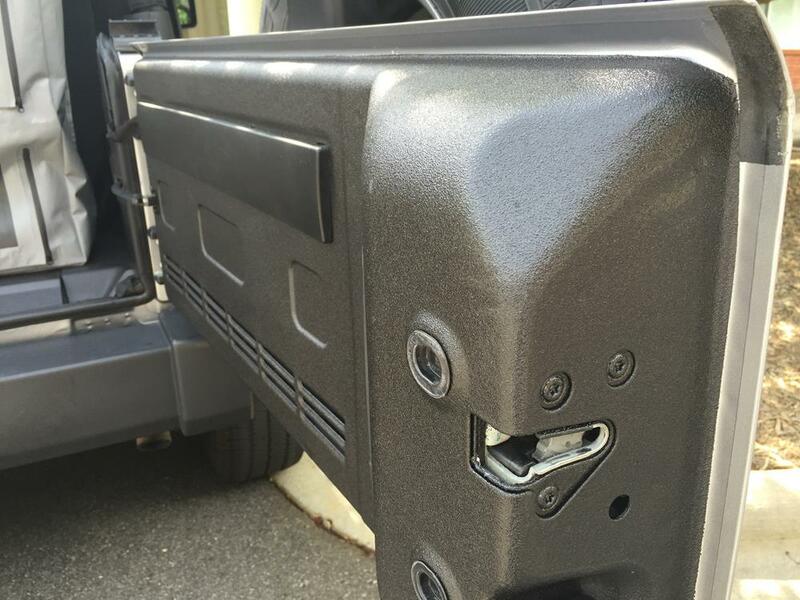 The inside of the tailgate and the bottom portion of the roll bars even received the Rhino Lining’s treatment. 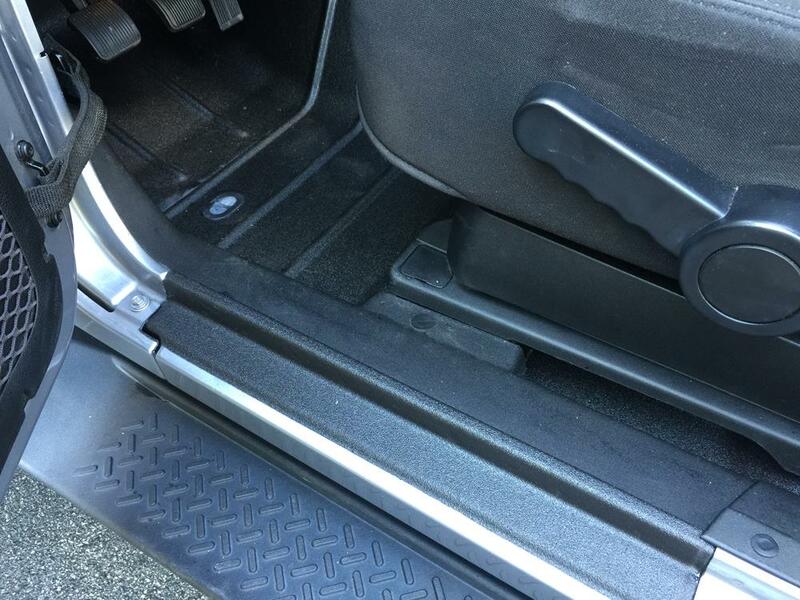 Not only did the Rhino Lining solve my problems related to leaving the Jeep’s top off all summer, but it will also make cleaning the Jeep a breeze. 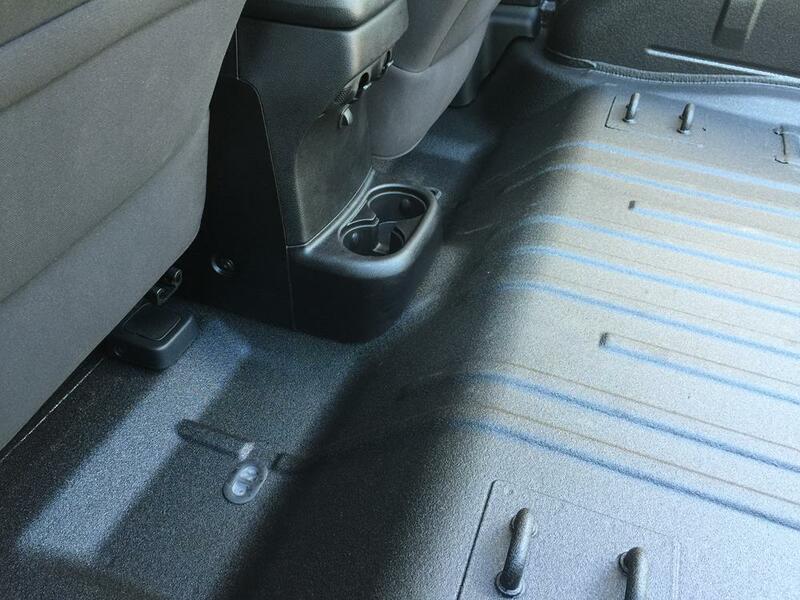 Rhino Linings prevents any rust from forming on the inside of the vehicle as well. Now, onto driving, and I was pleased to find that there was no difference in road noise, with or without the ‘goop’ and the carpet padding. The Jeep sounded 100% the same as it had before (makes you wonder why all of that stuff was in there to begin with?). What a relief! 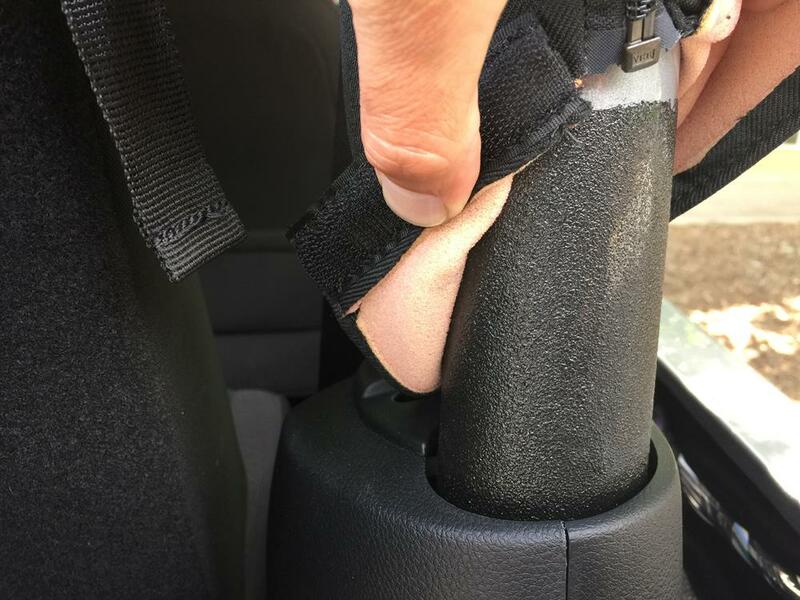 The Rhino Lining does not get extremely hot in the sun (stays comfortable to the touch) and it looks fantastic. The bottom line is that I absolutely love how everything turned out with this part of the build. A job well done by Robert and his crew!